How to build a solar wall oven? You are here: Home » » Living in your Home » Green home conversion » How to build a solar wall oven? After having written a post about building a solar oven, I was asked over the weekend by a friend, could I build one into the home. I took the challenge to make a plan. I was sitting out by Canyon Lake at a party, so I did not search for solar wall ovens; otherwise, I would have directed him to a site that I found after I came back home. My first response was an easy way out. I suggested adding a solar panel to power an electric oven, hence a solar oven. Not what he wanted, so I considered the possibilities. Asolar oven should be thought of as a slow cooker, and this plays as a big factor when adding it into the home. You will need to take good sunlight into the cooker to generate the heat for cooking. That sunlight has to be available for several hours. If your home is in an established neighborhood, you will face plants, bushes, trees, and buildings in your own yard and your neighbors’ yards. Before making any plans, check that you have enough light near the kitchen walls or roof. If you discover that there is enough, then we can proceed. Going through an exterior wall seems the logical course for building a solar oven. 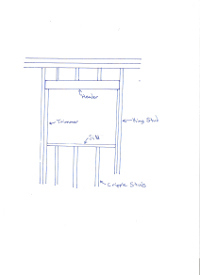 I did this quick sketch below to show you the elements that go into a window frame, because this is the same type of framing that you will need for your oven. The studs will be there, so you will need the header, the sill, and the two trimmer pieces. You will need to remove more of the exterior covering, like the brick, than the actual opening for this oven. This is because you will want to add a moisture to cover the wood and the exterior sheathing. For the oven, I would make a box out of plywood that is suitable for sheathing a home. This sheathing will also need to be covered by a moisture barrier. The top will be a piece of glass which is sealed into place. If I make this window on a flat top, I will create a surface to collect water, so the top will be angled with no lip to catch water (I want it to roll off). The angled top would probably be better for collecting sunlight too. Inside the box I would use some type of insulation on the surfaces that are not the window. I think a solid insulation panel would be good here. I would seal all of the corners with HVAC duct tape (the shiny stuff). On the bottom of the box, I would have a metal plate to reflect the light back up. Then I would add a rack for the cooking dishes to sit on. The other sides of the walls would have a black covering, such as tile or wood painted black. The door side of the box will require a good seal to trap the heat in. I would secure the unit into the framing like I would a window; however the weight may be a bit too much, so I would have to consider additional bracing below the unit. After reinstalling the exterior covering, I would place flashing over the top and sides of the box to prevent moisture penetration. Of course the flashing needs to be caulked. What if you want it in an interior wall or cabinet? This was the next challenge that was posited my way. If I will not being using a solar panel, then I would need a way to catch the sunlight to bring down to my oven. The most practical solution to me would be a solar tube. The box would be built with the same specifications, except that the top does not need to be angled. I would want the light fixture end of the tube to fit into the top plate of the box. The box will not need the moisture barrier either. Fitting it would be like building a cabinet for a regular oven. My one concern would be the temperature of the different parts. I do not want any hot metal surface heating the framing members. With the exterior wall unit, I feel that there is less chance for this to happen, but an interior unit may bring up some concerns. The end of the tube through the roof will be installed with the same concerns that always accompany the placement and installation of these devices. Would I make one? Since thinking about how I would build one, the idea does appeal to me. I am not sure that this could become my main cooking appliance. Right now I am facing a good deal of cloud cover in Houston. I really think that I would have to test it out before tearing into my walls, or dedicating space to a unit. I like the solar oven that I have already built. I now placed it into a table for my bench. I do use my oven quite a bit, so the solar panel idea does not sound to bad to me.I need to think about it some more. Green homes and using solar panels are becoming more popular, so maybe the time has come for solar ovens to be considered as a feature on our homes. Once I came back from my trip, I decided to do a little search. It turns out (as I half expected) that this idea already existed, so go over to this site to find out how a working unit was built. This entry was posted on Tuesday, October 27th, 2009 at 10:08 am	and is filed under Green home conversion. You can follow any responses to this entry through the RSS 2.0 feed. The Professional Green Network(PGN) is an affordable source to help you learn, live, and be green in your homes and businesses. Our mission is to educate, inform, support, and train those who want to learn about green, become more eco-friendly, and be a part of green opportunities economically and with commitment that respect the environment.